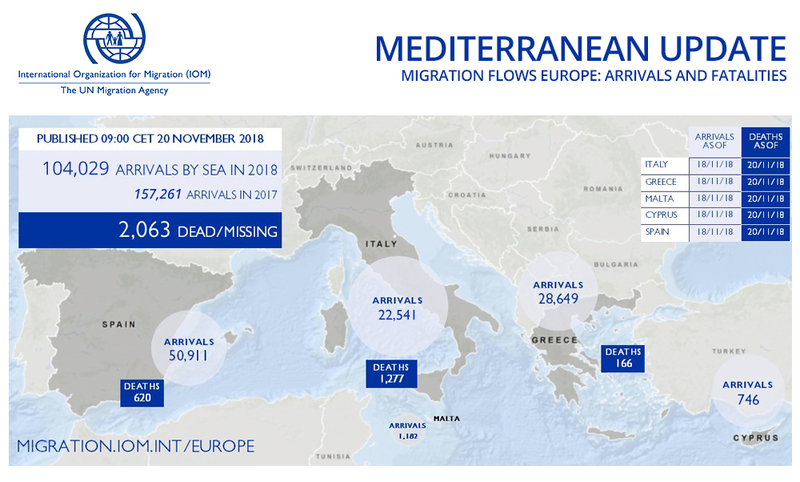 Geneva – IOM, the UN Migration Agency, reports that 104,029 migrants and refugees entered Europe by sea in 2018 through 18 November. Spain topped 50,911 – more irregular arrivals to Spain through 45 weeks of 2018 than all arrivals during the past three years combined (See Table 6). This marks the fifth straight year arrivals of irregular migrants and refugees have topped the 100,000 mark, although this year’s totals are low compared to those at this time in 2017 (157,261) and 2016 (345,544). As colder weather conditions arrive, sea passage to Europe grows ever deadlier. IOM’s Missing Migrants Project (MMP) in Berlin noted this week that at least 22 people went missing in the Atlantic Ocean off Morocco’s southern province of Tiznit on 18 November. Three survivors managed to swim to shore and alert the authorities that the boat in which they were trying to reach Spain’s Canary Islands had capsized. A search and rescue operation was underway on Monday. But, due to the difficult weather conditions, no trace of the boat or its occupants had been found. On 16 November, the remains of a migrant were recovered near Caños de Meca, Cádiz, Spain, while the body of another man was recovered in the same area on 18 November. They are the 20th and 21st victims of the shipwreck that took place on 5 November off the coast of Barbate. In the last two weeks, the remains of 21 people have been located at sea or have washed up on the shore of Caños de Meca. Since the beginning of 2018, at least 655 people have lost their lives trying to reach Spain: 620 of those deaths happened in the Western Mediterranean, while at least 35 deaths were recorded between the shores of North and West Africa and the Canary Islands. A recent report by a Spanish foundation for investigative journalism, porCausa.org, found that more than 6,700 people have died or disappeared while trying to reach Spain since 1988. In the Central Mediterranean, MMP reported that a boat capsized off the coast of Sardinia on 15 November. Three young men of Algerian nationality were rescued from the small island of Toro, and they reported to Italian authorities that 12 of them had departed a few days before from Annaba, Algeria. A search and rescue operation that was launched was able to retrieve the bodies of two men. Tragically, seven migrants remain missing. Antigoni Avgeropoulou reported Monday (19 November) that since the start of last weekend the Hellenic Coast Guard (HCG) was involved in at least two incidents requiring search and rescue operations off islands of Samos and Kos. The HCG rescued a total of 92 migrants and transferred them to those respective islands. Another 96 arrivals between Thursday and Sunday to Samos as well as to Chios, Lesvos and Kalymnos bring to 28,649 the total number of sea arrivals to Greece this year through 18 November. That is just short of the total (29,501) arriving through all of last year, a total that appears will be surpassed in 2018 (See Table 8.b). Maya Abu Ata reported through the first half of November nearly 15,000 stranded migrants have left Libya for their home countries under IOM’s Voluntary Humanitarian Return (VHR) programme. The total departure number is 14,905 since 1 January 2018. During the first two weeks of November a total of 713 men and women were returned under VHR. They went home to Niger, Sierra Leone, Ghana, Nigeria, Congo, Ethiopia, Somalia and Pakistan. About a quarter of these November beneficiaries of VHR had been taken from detention centres. The rest were living at large in Libyan urban areas. Flavio Di Giacomo reported Monday monthly arrivals to Italy have averaged fewer than 2,500 men, women and children entering Italy by sea after departing North Africa since the start of November 2017. July 2017 was the last time monthly sea arrivals of irregular migrants and refugees surpassed 10,000 men, women and children – a total that arrived in 12 of the previous 13 months before that date – and had been arriving regularly in previous years of the Mediterranean emergency (See Table 7). Ana Dodevska reported Monday irregular migrants to Spain continue to arrive at a rate of almost 140 per day during the month of November, almost the rate they arrived this year during the summer months and in much heavier daily averages than were seen in the spring months of March, April and May. October was Spain’s busiest month for sea arrivals on month on record, with migrants or refugees entering by sea at a rate of over 350 people per day (See Table 2). IOM’s Missing Migrants Project (MMP) has recorded 3,242 people who have died or gone missing on migratory routes across the globe in 2018 (See Table 3). Beyond the Mediterranean’s sea routes, MMP this week recorded three deaths along land routes in Europe. UNHCR reported the deaths of two people on the Serbia-Bosnia and Herzegovina border in early November. On 11 November, the remains of a young man of Iranian nationality were recovered from the banks of the Drina river, which runs along a 200km stretch of the border between the two countries. He is believed to have been part of a group of migrants and refugees who crossed the river into Bosnia ten days earlier, when the disappearance of two Iranian men were reported. The body of the other man has not been recovered. In the UK, the body of an individual was found underneath a bus at the Eurotunnel terminal in Folkestone, Kent on 18 November. On the US-Mexico border, three men who had left their homes in Mexico to migrate north lost their lives while attempting to cross the border. The MMP team recorded the death of a man who drowned in the Río Bravo on 2 November. He had been deported from the US a few days earlier and was undertaking the dangerous crossing with the hope of reuniting with his daughter, who lives in Florida. His body was recovered near Matamoros, Tamaulipas, by Mexican civil protection authorities. Another man drowned in this same stretch of the river a few days later, on 16 November and has yet to be identified. On 14 November, US Border Patrol officers in Texas found the remains of a man on ranch land south of Laredo. Additionally, the MMP team recorded the violent death of a migrant in Mexico’s southern state of Veracruz, near Las Mojarras on 16 November. Missing Migrants Project data are compiled by IOM staff but come from a variety of sources, some of which are unofficial. To learn more about how data on migrants’ deaths and disappearances are collected, click here.